Right, time to finish this one up. Picture and text spam incoming. Saturday started with a panel from increasingly notable anime, manga and fandom researcher Alex Leavitt on the noitaminA programming block, and its relative success at its TV time slot compared to other shows. Alex started with a nice breakdown of how anime is produced, presented and distributed regarding the medium or format it’s created for originally (TV, movie, direct-to-whatever), as well as what anime tends to be popular with people in Japan compared to here in America in terms of ratings. It was cool to note that the series that tended to be popular in Japan (like Sazae-san, Doreamon, Crayon Shin-Chan, DBZ Kai, etc.) tended to fall in more accessible times like dinner-time or early mornings, tended to be long running, and tended to (especially in the cases of ones like Doraemon and Sazae-san) be essentially cultural institutions where even people who don’t watch anime would know of these series, much like how most people here would know shows like The Simpsons. Next came a breakdown of programming and demographics, regarding the late-night shows, the shows that people who watch things like fansubs and the stuff coming out here in the US watch. It was interesting to note how noitaminA in its weekly late-night spot, by aiming at a population that tended not to watch late-night anime with josei/seinen-type properties managed to more often than not garner more ratings than their competitors. For contrast, Alex brought up how another programming experiment in Anime no Chikara with original material compared to most other properties has had mixed results, but it’s kind of apples and oranges in both blocks in regards to who they target. What will be interesting to see is where noitaminA will go especially since they’ve started with live-action programming recently, and if results will still pan out for them or not. Overall, this was a very good and informative panel, and what made it even better was Alex’s unintentional cosplay of Arashi from Paradise Kiss (I believe that’s what it was. :P), one of noitaminA‘s works. Yomiko Readman, The Paper from Read or Die. Ready for action. Following that was the US premier (aw yeah!) of Welcome to THE SPACE SHOW, which was a solid, but not great, movie. The whole story of the movie seemed to lose itself halfway through, as several different plots were rushed through and piled on top of each other where it felt like more time should have been required to explain and work things together better. The main story of the cast of children finding their way back to Earth sort of fell to the background, with ideas such as the history of some of the aliens and what the Space Show actually is taking precedence, and while these were interesting to see, the execution of the “answers” was lacking. However, given the already long runtime of 136 minutes, it makes me wonder what would have happened had this had been a series of OVAs instead of a movie. Besides that, the characters were interesting (having one of the main characters voiced by Keiji Fujiwara only helps here), the music, setting and animation was well done, and I liked some of the main ideas of the movie. It was fun, beautiful and fantastical, and I wouldn’t mind seeing it again, that’s for sure. In the same room after this panel was one for Welcome to THE SPACE SHOW director Koji Masunari, producer Tomonori Ochikoshi, and animator Masashi Ishihama, as talked about here. The Q&A session was fun, as everyone who lined up, including myself, happened to know each other in some Internet quantity, as SDS noted next to me in line. One of the main ideas from the film was one that I remembered being very important in ROD the TV, an earlier work that the trio worked on, so I asked them if ideas from their previous works carried on to this movie. Director Masunari replied that things like characters were carried over, such as the Martian singer from Kamichu!, but wanted me to clarify my question. After using the strongest example from the movie that I remembered (the message being a variation on The Prime Directive, you could say), Masunari replied that it’s something that he and screenwriter Hideyuki Kurata have tried to incorporate in every work they do, which was cool to find out. It was also cool to also find out that I was also right about a hunch one of Maasaki Yuasa‘s roles in the film from another question, in that besides the opening of the movie, he also worked on the psychedelic scenes of The Space Show itself. A huge block of programming was missed as I went for dinner with other friends, and I just came back to see the end of wah’s panel on Akiyuki Shinbo. If SDS’s panel was the one that I most wanted to see all of, this was the one after that I felt sad for missing most of. I managed to see some of wah’s fanaticism and masterful knowledge of the man and his work with SHAFT, which was cool, but I would have liked to be able to see more information about how far he’s come from where he was at the start, and given that apparently there hasn’t been a recording of the panel that’s surfaced, I worry if I ever will. This was also competing with an as always filled Bandai After Dark panel, as well as the Touhou Project panel, which was also filled, so this was a busy spot. After hearing of the surprises in the Bandai panel (would have been nice to see Christina Vee dress as Mio sing as Mio, wouldn’t have been nice to see the apparent leftovers of Lucky Star T-shirts again), and that the Touhou panel was pretty informative, I felt sad missing all of that. 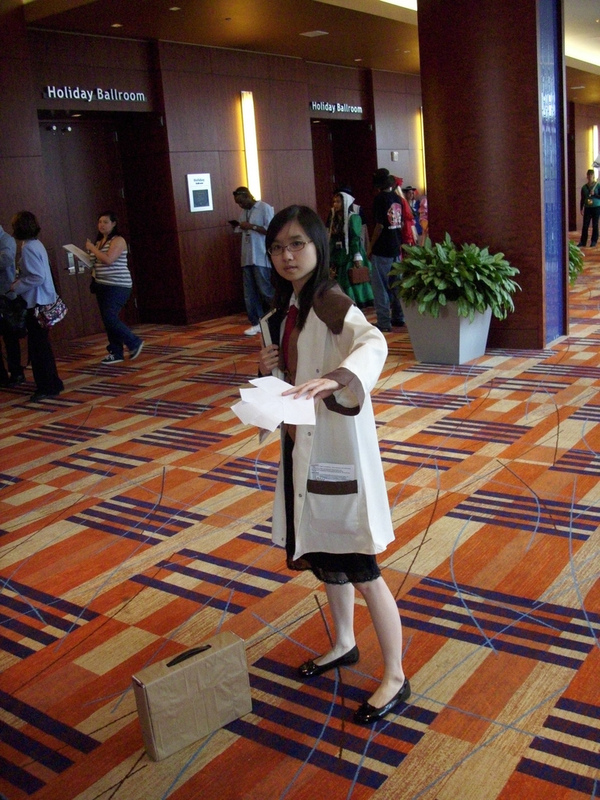 But it was also a testament of Otakon manage to have something continually interesting for me this con. HTT knows that Sawa-chan-sensei is boss. We aren't worthy. Afterwards was a wait to possibly do some Saturday night karaoke. In this case, we were able to sign up, but came too late to sing as time ran out. But pretty cool stuff happened. The list of karaoke songs included this one https://bignanime.files.wordpress.com/2010/08/02-prayer-somewhere-on-the-planet.mp3 which happened to the B-side to the TYTANIA ed from Psychic Lover, “Lost in Space”. But the staff was unable to find any lyrics for the song. So thanks to the help of TheStupidOne, I was able to use the Internet to try finding lyrics, though I was racing after time to do so. After finding lyrics in only hiragana and kanji, I put out an APB in twitter asking if someone could find romaji or create romaji from the lyrics. Thanks to the help of Matthew creating romaji, I had the lyrics, and had the hope possibly singing them on Sunday. And as Saturday closed, Link, W-General, Mizusu, and myself just sat at a random spot on the BCC floor and just talked about conventions: stories about this Otakon and cons past, traveling to and fro, the pros and cons of small and big cons, and so on. It’s times like that where I realize and appreciate how much meeting up with people at convention makes the experience that much more memorable and fun. It was just chilling, doing nothing but talking, but much in the same way as it was back in college, it was an experience in a way. I’m not sure I could express it any better than that, but it was definitely one of the highlights of my convention. 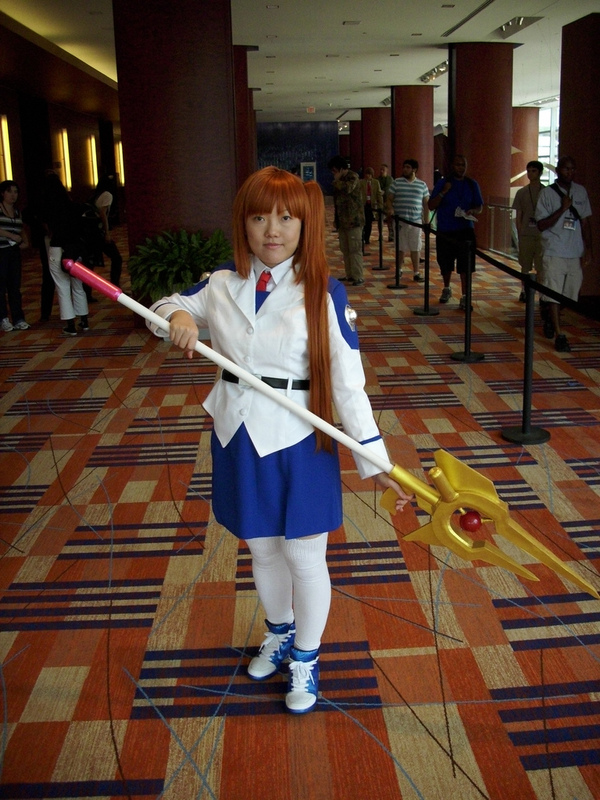 Nunally Lamperouge from Code Geass. Eyes open =? Sunday, Sunday, Sunday. The goal was to karaoke, and by and large that was successful. I was able to get three songs off, one of them being the song I was looking for, and one of them including digitalboy and omo singing “SOMEONE ELSE” from the Working!! anime (still think that the ED is better) which was an interesting experience. Still, we came off better than I had expected, and I do feel like I would have been fine singing in a higher octave than I did, especially since digitalboy was doing that. Of course video was taken of the attempt, and you can find it if you look for it. 😛 I finished off by singing the first TV opening to You’re Under Arrest, and video was also taken of that as well. That one just needs to be uploaded, and that one will be another time as well. It ended up being that I missed out on panels and the closing ceremony however, after a final run to the Dealer’s Room and one final run through the Kinukuniya box of CDs at 75% cost that took longer than expected. Of the missed events, what I would have liked to see was The Japanese Directors & Producers Panel, especially because I know of last year’s event which was sparsely attended leading to an awesome sit-down session. The same thing happened again this year, which is plenty sad in that as others have said, these are the people who help create the anime that we enjoy. And what I wouldn’t give to have (and not miss) the opportunity to get some insight from the creators. Hopefully I have the chance to do so again. I was able to catch the tail end of the figure panel, just in time for the Q&A where known figure connoisseurs like VManofMana and superrats were able to answer some interesting questions, like one on what is one of the more interesting and possibly distressing things to do to figures (involving white stuff, to say the least). As the con experience started with the omokrew, so it ended, as we had a nice expensive meal at a Phillips Restaurant, and then parted ways, another con over, but not forgotten. Ryougi Shiki from Kara no Kyoukai. 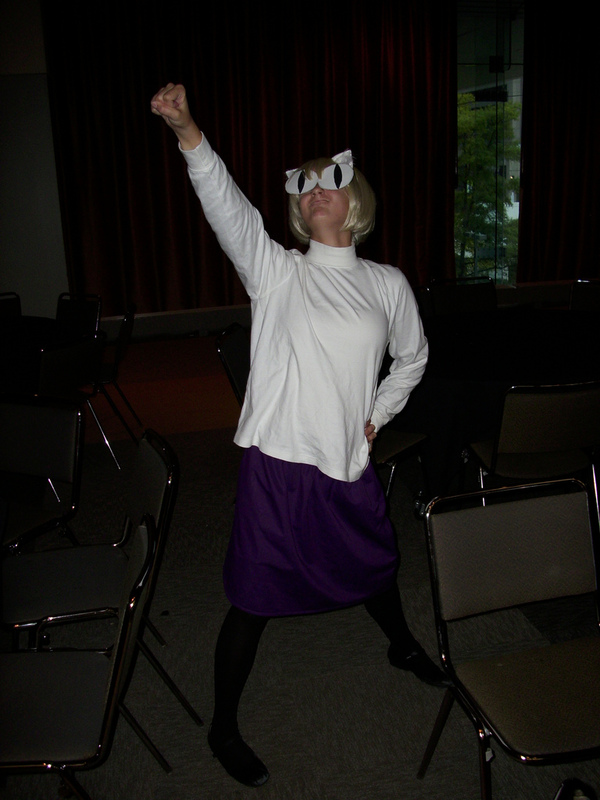 Only one I saw, and according to the cosplayer apparently I was the first one who recognized her. 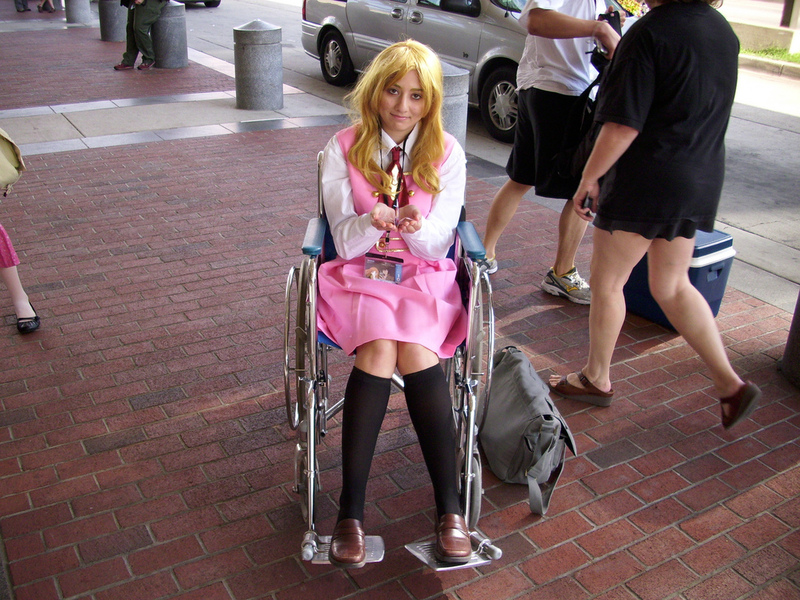 Overall, Otakon 2010 was much more enjoyable than expected. There was always something that was interesting throughout, and I met again a lot more cool people than I listed (of which I’m sure to have missed plenty, but do remember people like VamptVo, Janai, Patz, hikki from #moy, Chris Beveridge from ANN, Clarissa from AWO I believe, the Japanator staff… Please be sure to let me know if I forgot you). Things ran smoothly, and I never felt overwhelmed by the crowd at any point, nor were there times where I felt “I’m getting to old for this” (at 24? Yes. Granted, the constant “MARCO POLO”, “The GAME” and “buttscratcher” memes weren’t helping.) I hope that I can go again next year, though depending on my situation at the time (hopefully at the start of residency somewhere), I’m not sure if I could be at the convention all three days, much less one. I still have hope though, just like I still have hope that one con I can actually get into the Bandai After Dark panel. One con I can sit down in a circle with creators and just chew the fat. One con I can try being a panelist to see how it feels. And so on. The soul still burns. Here are links to my Day 2 and Day 3 Flickr galleries. Have fun with them. And to end it, have some Neko Arc from Melty Blood. 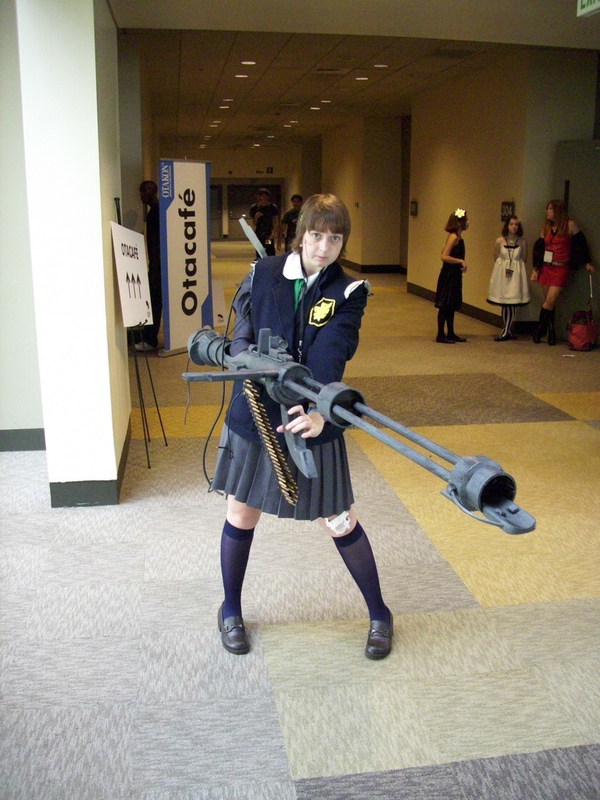 WTF TBN, why do you find all the best cosplayers?! 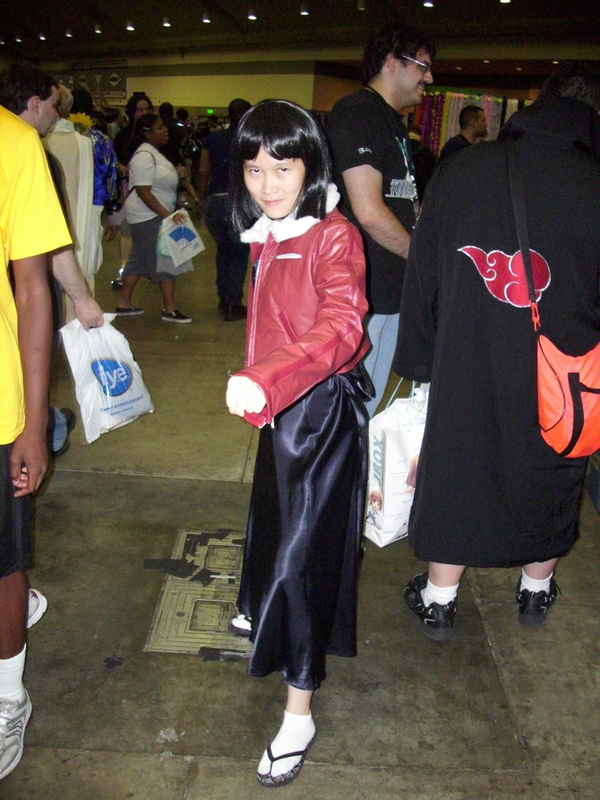 I might’ve fainted if I saw Ryougi Shiki! The Nunally one is amazing, too, and the Sawa-chan-sensei thing is magical.